Microsoft is reported to be in talks to buy a stake in Facebook that could value the social networking website at as much as $10bn (£5bn). The talks could lead to a showdown with Microsoft's rival, Google, which is also keen to invest in Facebook, the Wall Street Journal says. The newspaper says Microsoft wants to buy up to 5% of Facebook, for a price between $300m and $500m. Microsoft and Google both declined to comment on the report. Facebook already has a relationship with Microsoft, which is the exclusive provider of banner advertising and sponsored links on the site. "We think it's likely that Microsoft would be considering an investment in Facebook given their existing relationship and the strong growth potential of that market," said Andy Miedler from the US brokerage Edward Jones. One of Facebook's directors, Peter Thiel, recently said that the site would consider a buyout offer in excess of $10bn. 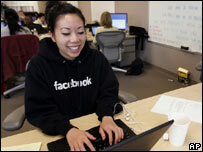 More than 40 million people use Facebook to set up personal web pages and communicate with each other. The company expects to make a profit of $30m this year so on conventional valuations a $10bn price tag would look expensive.